A High Back Armchair will add a special touch to all rooms. You can choose from many styles at Chesterfield Lounges. We have several styles including the Nadia Red Wing Chair (available in other colours) that have a buttoned bottom cushion. 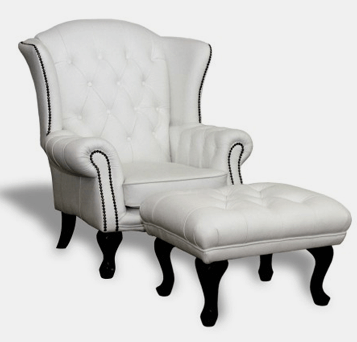 There are also many styles of wing chair that have sprung cushions that are sure to give long and reliable comfort. At Chesterfield Lounges we like to think we offer a great value product. 100% real leather at affordable prices. Despite our very competitive prices we also many specials on an ongoing basis. If you have a look at our Wing Chair Sale page you will see a couple of options where you can buy our chairs at an even cheaper price. Sure to compete with larger retailers. You can get the chairs in different leather colours so make sure if you are after something a little specific that you contact us and we will see what options we have. Not only that but all our chairs are available in fabric. Either our suppliers fabrics or from Warwick fabrics. Modern High Back Wing Chairs are very popular. What defines Modern? It could be the cover you use. Wing Chairs look fantastic in many fabrics or funky colours like orange or lime green. Blending the old style design with modern fabrics is a great way to bring the traditional wing chair into the modern age. If we have a buttoned wing chair, you can also have it upholstered in fabric and without buttons, which changes the style significantly. Of course, high back wing chairs are perfect in many settings, but particularly the living room. They blend with either your recliner lounge or modern styled sofa. Add a wing armchair in a patterned fabric rather than a plain leather or fabric will make the chair a feature and will surely be a talking point when you have visitors.